Bearer shares: a wonderful tool of corruption for Caribbean political elites! 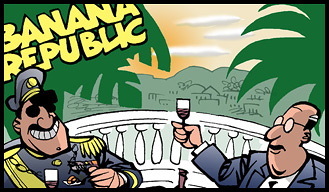 Could A Family of Crooks Get Control of a Small Caribbean Island Government? Once upon a time there were a family of crooks who got control of a government of a small island state. They knew they would not be in power for ever so they needed to devise a way of stealing [teefing] alot and stealing it quickly. One of those involved was a bent ex-bank employee, and had what some of his partners in the scheme would describe as a brain wave, or even a masterstroke idea. The initial idea was to control the government treasury and to start almost immediately in their first term to issue government Treasury Bills. The bills would need to be issued every month and plenty of them on a regular basis. The bills would give a compounded interest discounted up front equal to 24% per annum. They would not buy all the bills, allowing the market to buy the majority, thus not raising suspicions. The problem so far had been getting elected and that was soon sorted – they got elected by foul and unfair means. A few promises of lining the pocket forever of a bent politician from another political party, even perhaps a Knighthood… how could he refuse? Even down to the employment of his children and family in high flying and high paying jobs.